The St Mary's to Penzance route connects St Mary's, biggest island in the Isles of Scilly to Penzance in Cornwall on the south coast of England. The ferry route is operated by Isles of Scilly travel. This route accepts foot passengers only. With AFerry we always give you our best prices for ferries from St Mary's to Penzance. No matter which page you book from we always include all our special offers. And there is no need to look for a discount code. If we have an offer available, your ferry price will include the reduction or offer. There's no need to look at other websites. If you're not sure if the St Mary's to Penzance route is right for you or you can't decide between ferry companies, if there is more than one, you might also find it useful to read any reviews we have available. We ask all our customers to send us reviews for St Mary's to Penzance ferries. Remember though, that the earlier you book, the cheaper prices normally are. So don't spend too long deciding! St Mary's to Penzance is a popular route, so we advise you to book as soon as possible. You can't miss the Telegraph Tower, built in 1803 for the defence of the island and from which, 95 years later, Guglielmo Marconi, the inventor of the radio, received radio signals from a distance of 30 miles, a milestone at the time. Later the tower was used to broadcast Radio Scilly. Throughout its history the island was a strategic location for the British Crown. As a result some attractions that you can visit are Harry's Walls which are the remains of an artillery castle, the 8-point-star shaped fortification of The Garrison and Star Castle near the pier, which was built in 1593 fearing a new attack by the Kingdom of Spain, Peninnis Head lighthouse and the Memorial at Porthellick Cove, which marks the site where the body of Admiral Shovell was found after one of the worst naval disasters in British history in 1707. 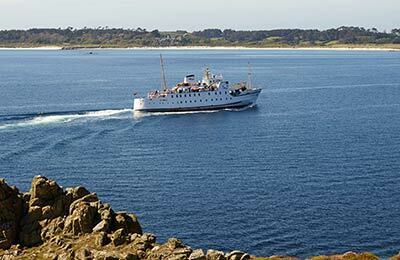 Book your ferry to the Isles of Scilly from Cornwall simply and securely with AFerry. During the last week of June you can enjoy the Festival of Golowan, where ancient Celtic traditions are celebrated, there is also music, fireworks and street performances. Everyone has a great time, especially in the giant beer tent with live music and dance until late in the evening. Penzance is the hometown of one of the fathers of electrochemistry, Humphry Davy. It is the largest of the villages in the far west of Cornwall, where you'll find over 30 pubs and many restaurants serving from traditional fish and chips to Italian, Thai, Chinese or Indian foods. Once you've sated your appetite, you have shops, a cinema and two night clubs at your disposal.